Thanks for stopping by! Today, members of the ODBD Design Team are sharing new inspiration with the products from the March Release. Today I'm sharing two projects using products from the March Release along with additional ODBD products, please see my complete supply list below. 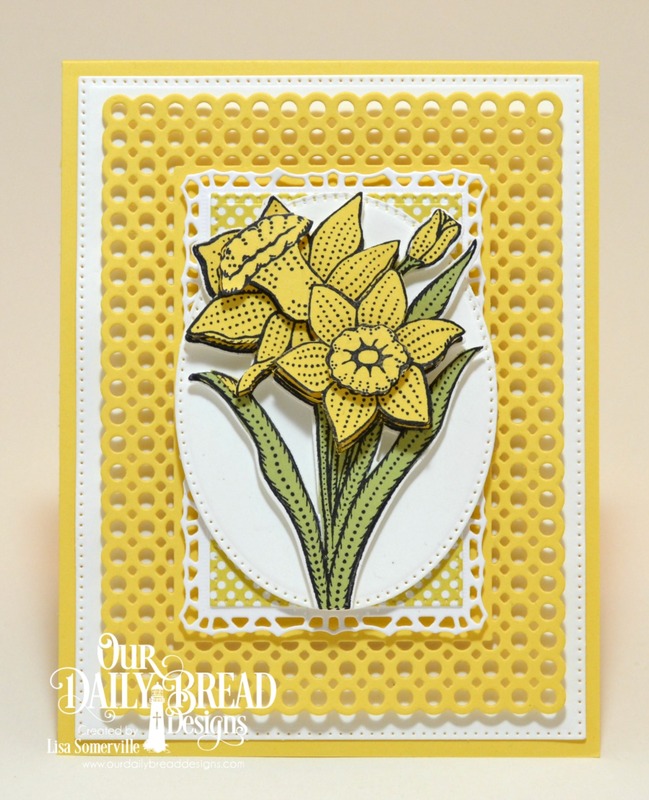 My first card uses the pretty Daffodils stamp set and coordinating die. I stamped and die cut the daffodils on White card stock, then paper pieced the flowers and stem using card stock. I did a little paper tole to add dimension to the flower. This next card uses God's Blessings Coloring Pages, the paper was colored with Watercolor Pencils and die cut using the Pierced Rectangles Die. Thanks for stopping by! Be sure to stop back on Friday for a Special Anniversary Blog Hop, celebrating Our Daily Bread Designs 9th Anniversary! Wow! Gram loves the daffodil card and so do I! Both cards are beautiful!